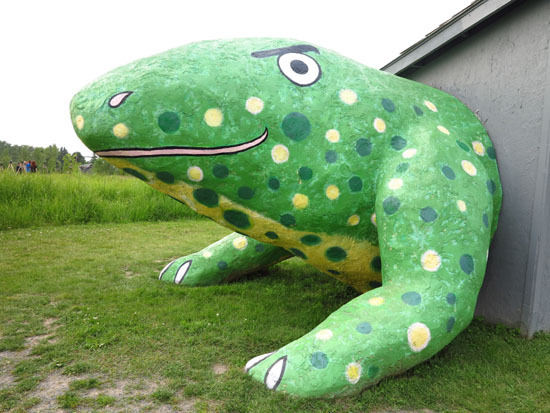 It was the huge, green polka-dotted frog that caught our attention. Then we noticed a 12-foot tall stack of old radios and more funky-looking metal and wood sculptures that we couldn’t really identify. What is this place? We passed it during a drive though Franconia, Minnesota, and were intrigued enough to stop on our return and see what it was all about. We found out that despite some of the weird-looking installations, the outdoor sculpture park was created with a serious purpose. 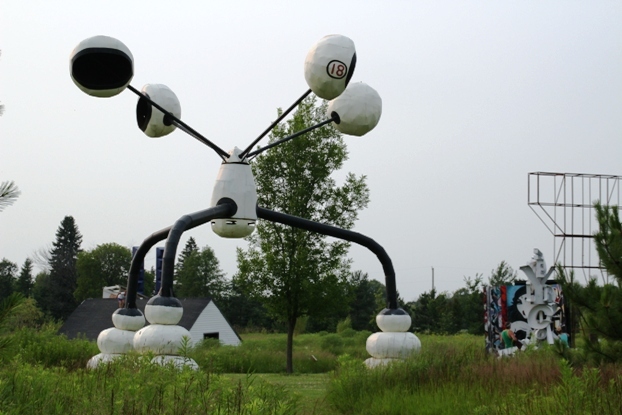 Located in the scenic St. Croix River Valley, Franconia Sculpture Park is a nonprofit arts organization with an active artist residency and community arts scene. 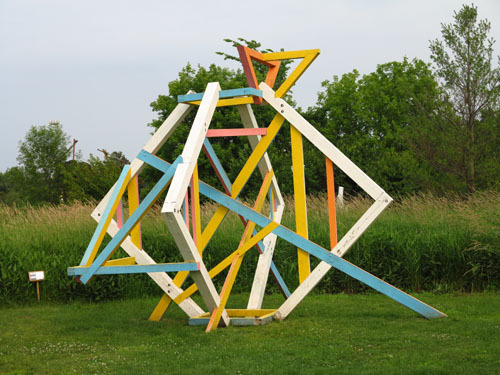 The 43-acre park was founded in 1996 by a small group of professional artists, including current Artistic Director/CEO John Hock, who envisioned a supportive artists’ community and open-air sculpture space that would inspire creativity from the artists and still be accessible to everyone. 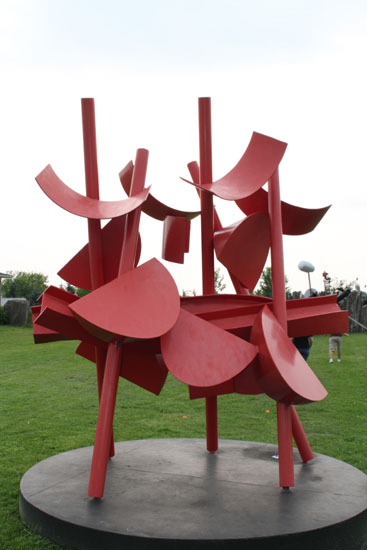 Through fellowships it supports emerging and mid-career artists and sculptors (40 in 2015) and provides display space for their creations. 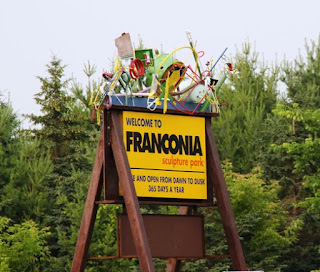 Franconia Sculpture Park is definitely accessible: It’s free to the public and open from dawn to dusk 365 days a year. 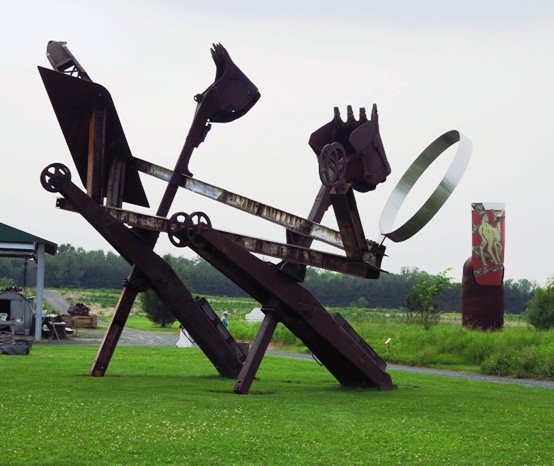 Visitors can wander over 43 acres of mowed land and gravel paths (or ride in a golf cart) and explore more than 100 ever-changing large-scale sculptures. With only about 45 minutes to explore the park, we covered as much of the open space as we could—and wished we had a couple of hours to dally among the fanciful creations. Many families were enjoying the sculptures on that summer Saturday, especially since a lot of the pieces are kid-friendly--meaning it’s okay to touch, climb, and slide on them. 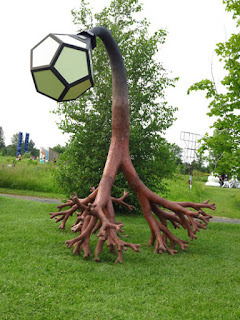 Adults are also encouraged to find their inner child and have a bit of fun exploring the premises and art works. Other interesting two-and three-dimensional sculptures included surveyors’ tripods with antennas going up and down (I couldn’t detect a pattern although there might have been one); a colorful Jungle Gym-type apparatus painted pink, yellow, and blue; wooden tower with a ladder (and door to peek inside); metal sculptures made from found items, an assemblage of large pipes, and much more. Surprisingly, more than 100,000 visitors find their way to Franconia each year. 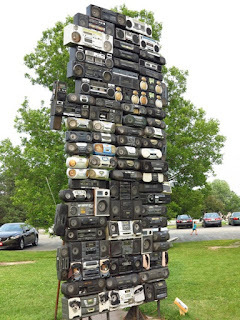 Visitors often interact with resident artists in special programs or participate in artist-led tours of exhibitions which are held between late April and early November. For the special 60-minute walking tour, the charge is $3 per person. Picnic tables are available, and dogs on leash are welcome. Additional works from resident artists are also displayed at Franconia in the City @ Casket Gallery in Northeast Minneapolis, Minnesota.